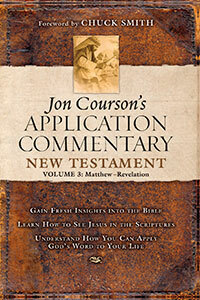 In Pastor Jon's unique style, this commentary is a scholarly work, but one that is easy to read and makes practical applications for us in our daily walk with Jesus. 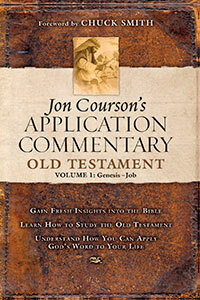 This volume covers Genesis through Job and is packed with Pastor Jon's insightful and practical commentary on the Old Testament Scriptures. 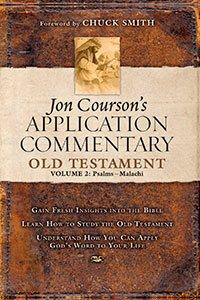 The second volume of the Jon Courson Application Commentary of the Old Testament covers Psalms through Malachi and is packed with Pastor Jon's insightful and practical commentary on the Old Testament Scriptures. 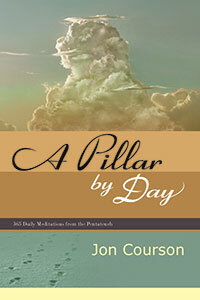 A Pillar By Day is a 365 day devotional to accompany your life's daily journeys. These devotionals are taken from Pastor Jon's teachings in the Pentateuch - Genesis, Exodus, Leviticus, Numbers and Deuteronomy. These first books of the Bible reveal Jesus in countless ways. With each step, your head will lift as your heart is filled with timeless truths. Find comfort in the shadow of our Lord, our Pillar Guide, and see how Old Testament lessons foreshadow New Testament hope. 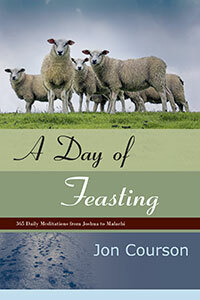 A Day of Feasting contains 365 meditations from the Biblical books of Joshua to Malachi that will accompany your life’s daily journeys. As you feast on God’s Word each day, your head will lift as your heart is filled with God’s timeless truths. As you commune daily with your Good Shepherd, you will see how the Old Testament lessons foreshadow the New Testament hope. 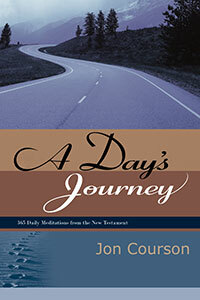 Beginning in the Gospel of Matthew and ending in the Book of Revelation, A Day's Journey is a collection of 365 short meditations mined from the riches of the New Testament. Presented in a daily devotional format, it is our prayer that this book will be an indispensable travel guide for the journey that is awaiting you each day. Pastor Jon Courson shares his heart in this encouraging book of God's faithfulness, "'He comforts us that we might comfort others.' And such is the purpose of this book - that people like you who are going through, or who will go through trials and tragedies, might discover what I've discovered in my own situation: Our Father is absolutely faithful; the Savior is so very real; and the Spirit is so incredibly comforting in times of trials." In March of 1982, Pastor Jon's first wife, Terry, at the age of 28, was taken to Heaven. Twelve years later, Jon's 16-year-old daughter Jessie was also taken home to Heaven. 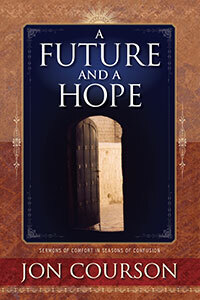 This book is a testimony to God's abundant faithfulness, not only to the husband and father who is looking forward to the day he will see them again, but to all those whose hearts long for Heaven. 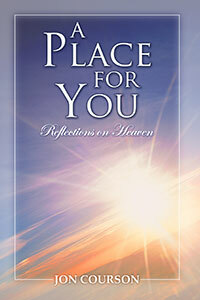 Comprised of Pastor Jon's teachings on Heaven and its impact on earthly life, our prayer is that A Place for You, Reflections on Heaven refocuses your eyes, warms your heart, and strengthens your soul. 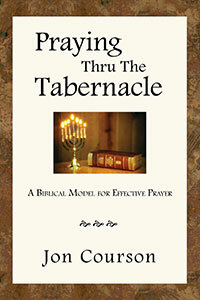 This pocket sized and powerful book reveals a Biblical model for prayer that is both practical and effective. This model is based on the Old Testament picture of the Tabernacle. In the Tabernacle, there are several different objects that were used by the priests in their ministry to the Lord. Each one of these objects also speaks of a particular aspect of prayer. Taken together they form a complete and effective model of prayer for us. 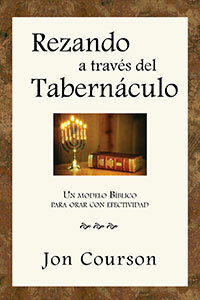 This is the Spanish Edition of "Praying Thru the Tabernacle"
This book is beautiful in its simplicity. It is the four Gospel books (Matthew, Mark, Luke and John) from the New Testament in New Living Translation. The difference is that they are blended together in a chronological format. The format helps us to gain a fresh perspective as we are brought face-to-face with the person of Jesus Christ. 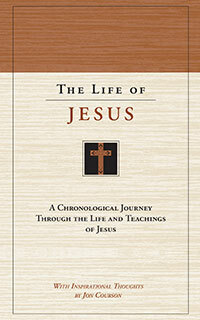 Helping readers to consider the uniqueness of Jesus, Jon Courson has written a short introduction to the book about the one solitary life that has powerfully shaped the course of history. Again at the end of the book, Jon writes a short closing that brings us to the heart of the whole matter: Where will you go to find eternal life? 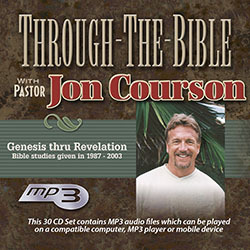 We have assembled this set of Pastor Jon's teachings through the entire Bible (Genesis thru Revelation) in MP3 audio format. These teachings include his verse by verse exposition of the Bible as well as the Sunday sermons which take a more in-depth look at a section of the Scripture from the verse by verse study. 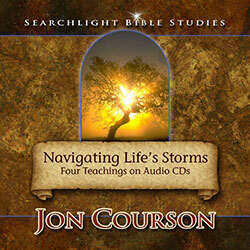 These MP3 teachings are available in two formats - CDs or USB Flash Drive. They both contain Jon's Thru-the-Bible teachings, the difference is the format that contains the files. The CDs can be used in any computer or CD player that is capable of playing MP3 audio files. The USB flash drive can be used in any computer or device with a USB port and the capability of playing MP3 audio files. An amazing prophetic picture is painted for us in Leviticus chapter 23. This chapter describes each of the Feasts of Israel. Pastor Jon takes us through these feasts and shows how each of them describes an important prophetic event. Some of these events have already taken place and some are yet to come. These 3 teachings will help give you an understanding of God's overall prophetic calendar. One of the most common question that people ask is, "What is God's will for me?" This question may be asked for something as important as your life's calling or who you should marry. It may also be asked because you simply want to know what God would have you do today. In these 4 teachings, Pastor Jon takes us through various places in Scripture to answer this important question. This fascinating 5 teaching series explores Biblical prophecy, world history and current events in the Middle East with a focus on Israel and Jerusalem. This is an excellent series for anyone wanting to have a Biblical perspective on current world events. God knows that we learn better if we can see a picture. He therefore gives us many fascinating pictures in the Bible. One of the most intriguing pictures of Jesus is found in understanding the tabernacle. In these 6 teachings Pastor Jon explains the tabernacle to us and how it illustrates the person and nature of Jesus. God instituted marriage as a means of blessing us. When we walk in obedience to God's design for marriage, it is a great blessing. When we don't, it is not. Marriage is also a picture of our relationship with God. In these 4 teachings Pastor Jon examines what the Bible has to say about the roles of husbands and wives. With this understanding we can be more effective in our marriage relationship . . . and our relationship with God. We live in a world where immorality is rampant and temptations are everywhere. But God calls us to be pure. These are 2 of Pastor Jon's key teachings on this subject of purity. This Scriptural look at purity will help us to have the understanding and passion that we need to be pure. The Bible tells us that we were created to worship . . . and we all worship someone or something. But the only One who is worthy to be worshipped is God. In these 4 teachings Pastor Jon examines what the Bible has to say about worship. The Ten Commandments are principles of God that are for all people for all time. They are God's direction for His people so they may know how to live rightly and joyfully. In these 12 teachings, Pastor Jon explores each of these commandments and shows us how God's commands apply to us today. In these four teachings, Pastor Jon teaches us about the awesome privilege . . . and responsibility . . . of prayer. If you are ready to learn more about communicating with your Savior, then these teachings will bless you. Our salvation is such an awesome gift that we could talk about it forever . . . and we probably will! We have chosen 4 of Pastor Jon's teachings on salvation that will help you in understanding and appreciating this wonderful gift from God. The apostle John said that there is no greater joy than to see your children walk in truth. As a parent you know that this is true. But parenting can also be quite difficult. These are 4 of Pastor Jon's teaching where he takes us through different Scriptures to see what God has to say about what it means to be a parent. If you look at the great men in the Bible - Abraham, Moses, David, Daniel . . . and Jesus - they all have one common characteristic - humility. It is not a characteristic that is prized in our culture, but it is essential to have if you want to be used by God. These 4 teachings look at what humility is . . . and what it isn't . . . and shows us why this characteristic is so key to being a Godly person. The Old Testament gives us many pictures and types of Jesus so that we may know our Lord more intimately. One of the most intriguing and accurate pictures of Jesus is seen in the Life of Joseph. This was a man who was subjected to many trials and tribulations, but kept a steadfast faith in the Father. In these 10 teachings on the life of Joseph we can not only learn more about our Lord Jesus, but also how we can successfully navigate challenges in our own lives. It is true that we have a real enemy in Satan, but it is also true that our Lord and Savior Jesus Christ has already given us victory over this enemy. In this life, we may continue to be harassed and attacked by the forces of darkness, but we do not have to give into them. In these 4 teachings, Pastor Jon shows us how to walk in victory and what the Bible has to say spiritually and practically about overcoming the enemy. At the beginning of the Book of Revelation we see seven messages that Jesus has for seven churches. In these 7 teachings, Pastor Jon shows us that these amazing messages have great relevance for us today because there is a four fold application in each one. In addition to their initial message to seven specific churches in the first century, they have a prophetic application as they speak about the entirety of Church history. These messages of Jesus further speak to each of us individually . . . and finally, they have application to individual churches and the entire Church of today. C. S. Lewis said that if Heaven is real, then that is all that matters and if Heaven isn't real, then nothing matters at all. This is very true . . . and we know that Heaven is very real. We know this because God told us so. Pastor Jon examines our future home in these 3 special teachings. There are various understandings and interpretations of end times Bible prophecy. In this 3 teaching series, Pastor Jon examines the reasons for a pre-tribulation rapture and why this understanding is important to us. It has been said that our faith swings on the hinge of the Cross. It is on the Cross where Jesus accomplished the amazing, and finished, work of salvation for us. In these 4 teachings Pastor Jon looks at what the Cross means to each of us who are saved. We know that storms will inevitably come into our lives. The issue is how will we handle those storms. In these 4 teachings, Pastor Jon shares with us about the faithful God to whom we can cling during storms . . . and the loving and powerful God who clings to us. The hope of Heaven is such an awesome gift that we will naturally want to share the Good News with others. But sometimes we feel inadequate or unsure of just how to share our faith. In these 4 teachings, Jon gives us some practical instruction on witnessing to others.